Today I officially arrived in China. 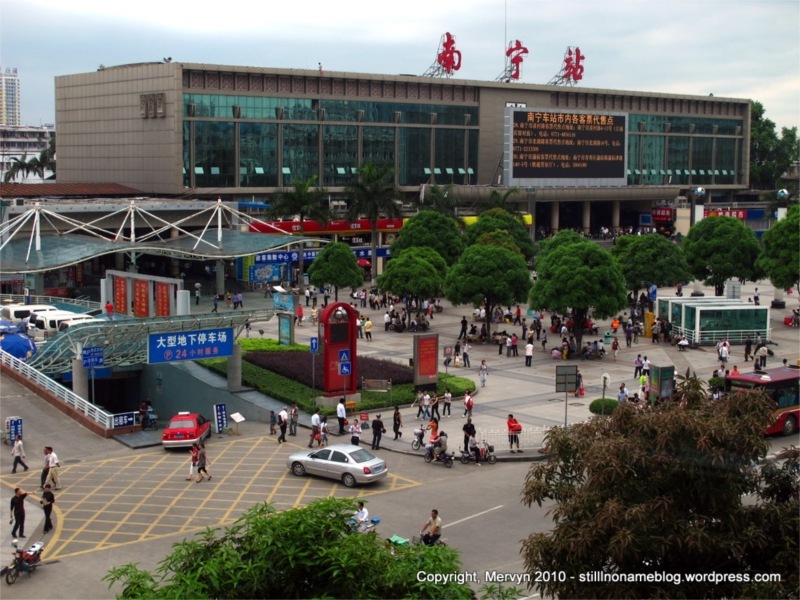 In reality, though, I entered China the moment I boarded last night’s train. 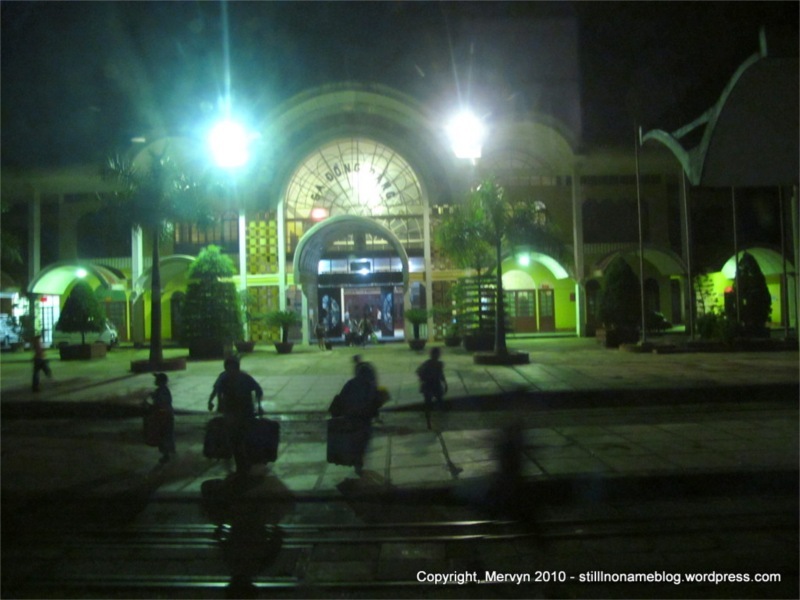 Yesterday at 9:40 p.m., I got on sleeper train from Hanoi, Vietnam to Nanning, China. I negotiated a motorcycle taxi to Gia Lam train station which is just across the river northeast of Hanoi’s Old Quarter. I overpaid a bit, but I didn’t care. Sure I could’ve paid just a tad more and taken a proper car taxi, but I prefer the wind in the hair, unfiltered experience on the back of a motorbike to the a/c climate controlled car. After making sure I was in the right waiting area, I took stock of my fellow travelers. They were all Chinese. I didn’t hear any Vietnamese. When I boarded the train, it was clear that all of the staff were Chinese and barely spoke English. My train ticket was in Chinese and Russian. No English in sight. For all intents and purposes I left Vietnam the moment I handed in my ticket and threw my bag onto the train. I’d sprung $25 or so for a soft sleeper cabin which can hold up to four people. I ended up being the only person in mine. A pyrrhic victory if there ever was one because I barely ended up using the cabin. I chatted and texted on the cell phone for a bit, got cut off because of weather, and drifted off to sleep. Starting at 2 a.m. it was like a night-long fever dream. 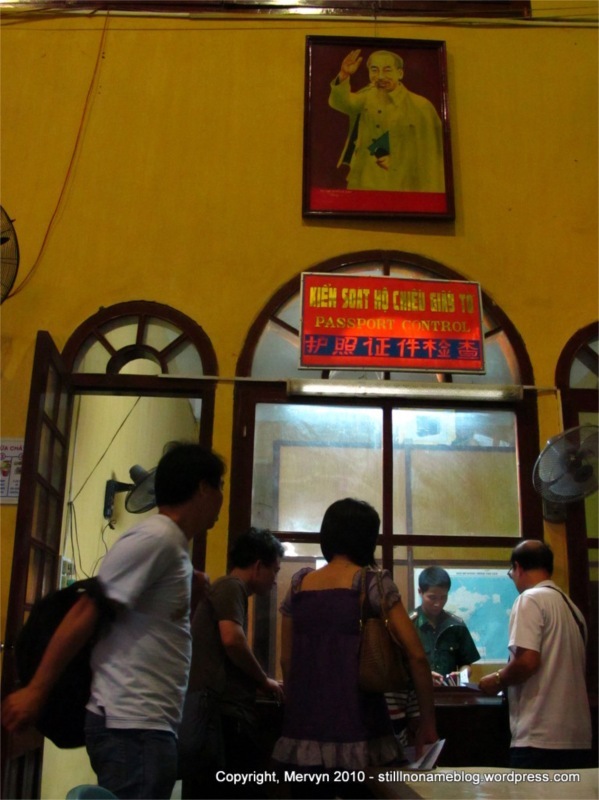 Clearing immigration on the Hanoi to Nanning train is a two and a half hour process. I remember handing in my passport to Vietnamese immigration, getting stamped out while Uncle Ho waved me goodbye out of Vietnam, getting woken up to fill out a customs form for China, getting woken up again to hand in my passport to China, dragging my luggage off to put it through an x-ray, meeting a Brit who was rock climbing his way through Asia, and being greeted by Mao into China and being told I was his favorite non-Catholic Filipino. That last one may not have happened. By the time 4:30 a.m. rolled around, I was doing the ugly traveler sleep face down in my soft sleeper compartment. If you plan on doing this trip yourself, consider saving a few bucks and just doing the hard sleeper. You’ll be so exhausted you’d probably fall asleep hanging upside down from the side of the train anyway. 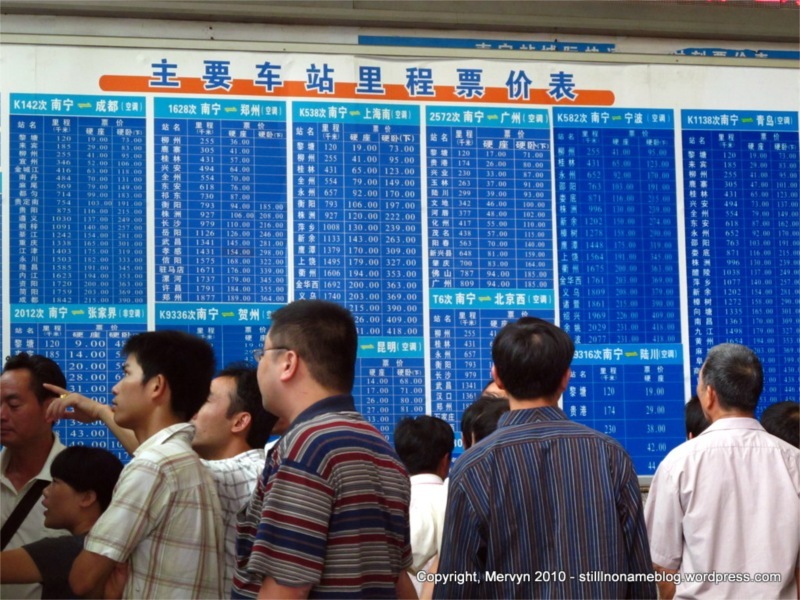 I disembarked at Nanning and ran to the ticket counter to try and get on a same-day train to Beijing. No luck. The train board was indecipherable. The only thing I recognized were the numbers and even then, it wasn’t clear whether they were times or prices. By the time I got to the front of the long line, the train was gone. The girl behind the counter looked terrified and bewildered when she used her English. “No ticket,” she confirmed, then pointed me to two prices for a sleeper and sitting car for the next day. I screwed up the local currency and mistakenly thought I didn’t have enough money—I told her I’d return. She nodded, wide-eyed. I walked outside the station and immediately noticed a few things. First off, the age distribution in China isn’t as skewed as in Vietnam. Less than 80% of the population here is under the age of thirty. It’s quite a dramatic difference after being around so many young people for my month in Vietnam. Second, Chinese people don’t seem to wear slippers. Outside of a few women with open toed shoes, everyone was wearing shoes. This differs from Vietnam and Cambodia. It saddens me that I’ll have to wear socks for the majority of my time here. My toes need to breath. Nanning isn’t on anyone’s radar outside of China, so far as I can tell. That despite the fact that it’s home to more than 2.5 million people (about 3 times the population of San Francisco). It’s quite modern, especially compared to Hanoi, at least around the train station. There are more cars and fewer motorbikes. Walking the main street from the train station, there seem to be fewer street hawkers and more actual shops than in Vietnam. As far as the people go, they seem more serious. I’ve smiled at a few people—train station clerks, food lady at the place I had lunch, receptionists—and didn’t’ get much of a response. This is quite a change from Thailand, Cambodia, and Vietnam, where smiles seem to come more easily. If I smile, I usually get a response in kind. It’s my opener to soften people up to what is inevitably going to be an awkward interaction. If smiles have no effect, interactions are going to get a lot more uncomfortable. I checked into my hotel and, as I walked up to my room, I passed two gruff-looking Chinese men in the hall. One cleared his throat and hawked a giant loogie onto the linoleum floor. Indoors. I’m not in Kansas anymore, Toto. I got to my room and crashed, my body trying desperately to make up for the previous night’s non-sleep. For some reason, someone—perhaps from the hotel—kept calling my room every 30 minutes. They’d repeat something over and over again and I’d just lamely say, “I don’t know. I have no idea what you’re saying.” I wanted to bash the phone into the table and yell, “Lady, just because you say it over and over again, louder and more slowly, doesn’t mean I am going to understand you. Please, for the love of God, please stop calling me. I need sleep.” Instead, I just stopped answering the phone. That wasn’t the only interruption, though. For some reason, people kept confusing my room for their own. This is remarkable because my room was the last one at the end of a long long hallway. Twice, people tried repeatedly to use their keycards on my door. The first guy, I answered and he looked confused and embarrassed. The second, I just sat there and listened to them struggle. All of a sudden, the door swung open and I was staring at a whole Chinese family. The lead guy immediately apologized, (I think) and I got up and closed the door. “Soft sleep?” she asked, eyes bulging. I nodded, and she looked surprised. Guess she thought I couldn’t afford a soft sleeper. It ended up costing me $120 bucks, but I wouldn’t have to spend a day and a half hugging my backpack trying to fall asleep on a hard bench. Well worth it, I thought. Finally, a few notes on Chinese TV. First, there is only one TV station in English and it appears to be government sponsored. One show spent half an hour with the Chinese host asking two vacuous Westerners why people kept pets when “there are starving people around the world.” The questioner appeared to be Chinese. My answer is this: The premise is flawed. Why do people do anything other than feed the poor and help the needy? Why got to a restaurant, buy a TV, wear nice clothes, put on makeup, or perhaps even have kids? Because it gives them something they need or enjoy. People have their time and their money and they choose to spend it how they will. For whatever reason, people determine that certain activities and possessions make their lives better in a way that helping poor people does not. Harsh but realistic, I think. Enough of that. Tomorrow I board a train for China. With lots of Chinese people. With questionable bathroom facilities. 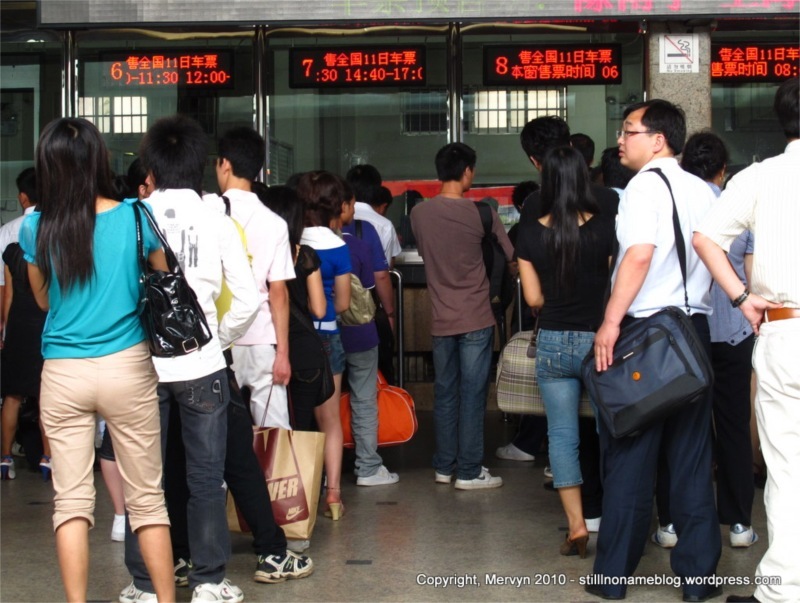 GALLERY: Click through to see more pictures of Chinese people and Chinese signs, a view from the Hanoi-Nanning train, and another pic of the Nanning train station.